I know that if I ask someone to name a single volcano, the chances are that they will hit upon Krakatoa; such is the degree to which the cataclysmic 1883 blast of the volcano has etched itself into the public consciousness. Remotely located in the Sunda Strait, between the Indonesia islands of Sumatra and Java, the islands that made up the long-dormant volcano were pretty much unheard of prior to August, 130 years ago, when all hell broke loose. In fact the locals had been aware that something was not quite right with Krakatoa for quite a while. Swarms of small earthquakes had been periodically shaking the volcano for years until, in May 1883, the bursting open of steam vents on the flanks testified to the presence of fresh magma close to the surface. Activity increased in fits and starts over the next few weeks until, by mid-June, violent blasts were expelling columns of ash and pumice several kilometres into the atmosphere. The climactic, paroxysmal, phase of the eruption began in earnest just after mid-day on the 26th of August, when a sequence of titanic explosions, heard all over Java, propelled a column of black ash and pumice to heights of more than 25 km. Even these, however, were dwarfed by what happened the following day. Although difficult to be certain, it looks as if the expulsion of vast quantities of magma had left the volcano structurally unstable so that it began to collapse in upon itself, allowing seawater to pour into the magma chamber. The violent fusion of molten rock and cold water triggered a detonation so ear-splitting that some have speculated that it may have been the loudest noise in recorded history. Whether true or not, its volume was sufficient to transmit the sound an astonishing distance; as far, in fact, as Alice Springs, 4,600km away in the heart of Australia. To put this in a European perspective, if the explosion had occurred in the Canary Islands, it would have been heard as far away as Liverpool and Copenhagen. Such was the shock to the planet’s atmosphere that the resulting pressure spike registered on barometers around the world as it circled the planet four times before dissipating. At the same time that the detonation blasted magma upwards, it spawned colossal flows of hot ash, pumice, and debris that cascaded down Krakatoa’s flanks, displacing the surrounding waters of the Strait and promoting the formation of giant tsunamis. Within minutes, more than 160 communities on neighbouring coastlines were swamped by the sea. For the inhabitants, there was no escape from the unstoppable waves. At Anjer, on the east coast of Java, they were as high as the 40m lighthouse, which they brought crashing down. In all, this terrible conspiracy of the gods of the sea and the underworld — Neptune and Vulcan — consigned more than 36,000 people to their graves, making the eruption the second most lethal of the last 250 years. The legacy of the blast did not, however, end there; the millions of tonnes of fine ash and sulphur particles ejected into the atmosphere reflecting sunlight back into space and causing temperatures across the globe to plunge by more than 1°C. Astonishingly, a similar cooling effect on the oceans could still be detected well into the twentieth century. Another bequest of the dust and gas scattered throughout the stratosphere was a spectacular atmospheric display that incorporated crimson, purple, and yellow sunsets alongside coloured suns and moons including – in the latter case – the blue variety. However unprecedented the 1883 blast may have seemed to those in Europe and North America, to whom newly installed undersea telegraph cables brought news of the catastrophe within hours, it is worth bearing in mind that, from a geological point of view, the Krakatoa eruption was pretty small beer. In fact, it wasn’t even the biggest of the 19th century; that honour going to the 1815 eruption of another Indonesia volcano, Tambora, which was 3–4 times bigger and that killed approaching 100,000 people. This event had an even greater impact on the global climate, to the extent that the following year is renowned — in Europe and North America — as the ‘year without a summer’; an episode of widespread crop failures that triggered the last, great, subsistence crisis in the western world. Looking further back in time, the Krakatoa explosion is dwarfed by the great super-eruptions that shake the planet a couple of times every 100 millennia. The stupendous blast that tore open a 100 km hole in Sumatra around 74,000 years ago, for example, dumped ash across one percent of the planet’s surface, plunged our world into volcanic winter, and was more than 100 times bigger. The anniversary of the 1883 Krakatoa blast is perhaps a good time to think about what future volcanic activity may hold in store for us, particularly as it is now nearly a quarter of a century since the last eruption big enough to give a volcanologist, like myself, sweaty palms. As regards where the next big bang will occur, your guess is as good as mine. Somewhere out there beneath one of the world’s 1500 or so active volcanoes I can guarantee, however, that pressure is building prior to unleashing an explosion that will put that of 1883 in the shade. Whether we have to wait a year, a decade or a century or more, it really is just a matter of time. 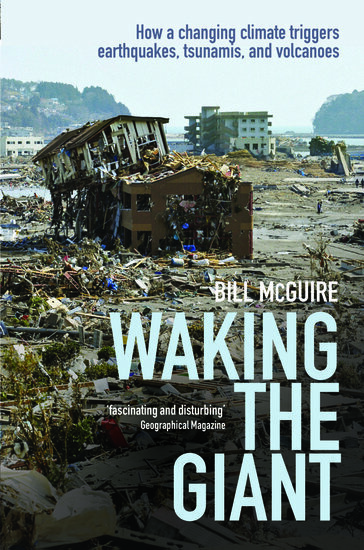 Bill McGuire is an academic, science writer, and broadcaster. He is currently Professor of Geophysical and Climate Hazards at UCL. Bill was a member of the UK Government Natural Hazard Working Group established in January 2005, in the wake of the Indian Ocean tsunami, and in 2010 a member of the Science Advisory Group in Emergencies (SAGE) addressing the Icelandic volcanic ash problem. He was also a contributing author on the recent Intergovernmental Panel on Climate Change (IPPC) report on extreme events. His books include Waking the Giant: How a changing climate triggers earthquakes, tsunamis, and volcanoes, Surviving Armageddon: Solutions for a Threatened Planet, and Seven Years to Save the Planet. Read his previous blog posts. Krakatoa is my fave volcano..hands down. I’ve not heard of any reports or ongoing theory work that directly links the 2010 Eyeaf.. Icelandic eruption to recent cold winters. Acknowledging activity in other areas such as the Kamchatka peninsula which would also likely have a significant/ direct bearing, setting that aspect aside for a moment – could there be a direct link to that specific eruption and the following two cold winters in the UK? Separately (but related) do you know if there is any research being conducted into the study of potential factors extraneous to the earth (gravitational effects of passing planetary orbits; large meteors/ comets; dark matter) that could be connected to or having a direct bearing on causing geological movement and thus volcanic activity?